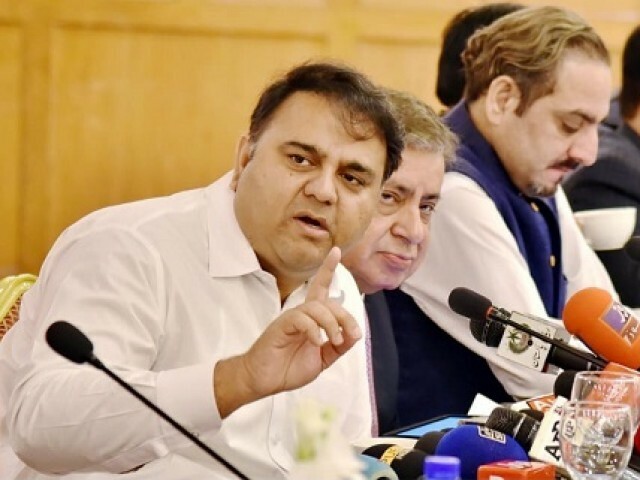 Federal Minister for Information Fawad Chaudhry on Thursday said the government will not enact any legislation related to the media without taking the journalist bodies into confidence. “The journalist bodies will be consulted before enacting any law related to the media industry. The government believes in freedom of expression and regulation does not mean censorship,” Chaudhry said while speaking at an event organised by the Council of Pakistan Newspaper Editors (CPNE). He said: For good legislation, consensus among all the stakeholders is needed and the government will also take opposition parties on-board before introducing new legislation. This assurance came after a recent announcement by the minister, suggesting that the government was contemplating merging the regulatory bodies looking after print and electronic media. The information minister, days after taking oath, had said the new government planned to merge the exiting regulatory bodies into a single authority – the Pakistan Media Regularity Authority. He clarified that the new media authority would be established to replace the existing Pakistan Electronic Media Regulatory Authority (Pemra), the Press Council of Pakistan (PCA) and the Pakistan Telecommunication Authority (PTA). The unified authority, he said, would provide one-window facility to the media outlets and the general public for redressal of the complaints. He added the measure would help save national resources as the new regulatory body would look after electronic, print and social media simultaneously. Some feared that the move could be the latest attempt to curb the freedom of expression in Pakistan. Rebuffing the impression, he insisted that in the modern age no one could impose restrictions on media. He said Pakistan enjoys far more freedom of expression compared to other developing countries. “The freedom achieved by media during past few decades is a landmark achievement which is unique in third world countries,” he added. Fawad Chaudhry said the government does not believe in censorship and that was the reason it lifted the ban on coverage of opposition parties on the state-run media, including the Pakistan Television. He said that the government has decided to constitute the Information Commission under the Right to Information Act (RTI) enacted last year and the first information commissioner would be appointed within one month time to ensure access to the information. About official advertisements, he said the government wants to introduce a transparent mechanism for their distribution and the input from media organisation would be welcomed in this connection. “The journalist bodies would have to play a role in it,” he added. He said the previous government spent Rs21 billion on advertisements. The present government will issue advertisements as per requirement and to ensure survival of the newspaper industry. Chaudhry said promotion of tourism is a major ingredient of the PTI manifesto and it will not be possible without relaxing visa regime for visiting foreign journalists and a policy in this regard has been prepared. Earlier the CPNE President Arif Nizami highlighted the problems faced by the media and a list of demands was presented to the minister. Paying tributes to the martyrs of the nation he said the nation owed to them as peace in the country is due to supreme sacrifices rendered by them. The CPNE standing committee meeting was attended by a large number of office-bearers and members including former president Zia Shahid, Senior Vice President Imtinan Shahid, Secretary General Dr Jabbar Khattak, Vice Presidents Ikram Sehgal, Ayaz Khan, Rehmat Ali Razi, Tahir Farooq, Arif Baloch, Joint Secretary Amir Mehmood, Finance Secretary Hamid Hussain Abidi, Senior Members Aijazul Haq, Kazim Khan, Irshad Ahmed Arif, Anwar Sajidi, Ghulam Nabi Chandio, Moazzam Fakhar, Abdul Rehman Mangrio, Ahmed Shafiq, Ahmed Iqbal Baloch, Zulfiqar Ahmed Rahat, Ali Ahmed Dhiloon, Bashir Ahmed Memon, Faqir Minthar Mangrio, Khalilur Rehman, Mian Fazal Ilahi, Muhammad Tahir, Mumtaz Ahmed Sadiq, Nasheed Raai, Shakil Ahmed Turabi, Syed Shamsuduha, Sher Muhammad Kharo, Yahya Khan Sadozai, Zubair Mehmood, Sardar Naeem, Hafiz Sanaullah, Naveed Sheikh, Muhammad Zahir, Mumtaz Bhatti, Sajjad Abbasi, Sardar Khan Niazi, Ashfaq Ahmed Mufti, Wazir Zada, Rashid Iqbal, Syed Naqi Kazimi, Abdussalam Hath, Aslam Mian and Syed Safir Hussain Shah.